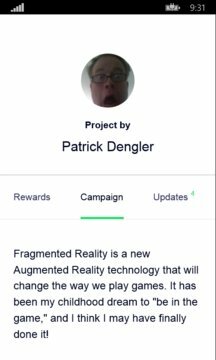 This application will keep you up to date on the latest information surrounding Fragmented Reality. Fragmented Reality is similar to Augmented Reality in that 3D scenes and gameplay are layered over the top of your camera view on your phone or tablet. But most importantly, the technology behind it (known as Blur) understands your environment and allows you to scan objects from the real world and insert them into your game-play. 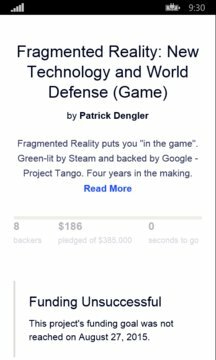 This allows you to add to, interact, and even disrupt the game in real time. My prototypical example is "Blurring" a bottle of Coke and Mentos into the scene, and watching them interact.